Put away your joysticks! The ‘616 patent describes a new way to control your character—with your voice. In this invention, the user controls his character’s actions using speech commands. There are two modes described within the invention, a learning mode and a non-learning mode. During the learning mode there are three stages shown in order to control a character. During the first stage the player is presented with a list of characters he can control. Once the player says one of the character names, the second stage is activated. In the second stage the player has to select an available action from the list of available actions. After selecting an action, the third stage is activated which includes more specific commands for the user to speak. If the player selects a correct command, a notification appears and the character performs the chosen action. The other mode, the non-learning mode, differs from the first in that no menu appears for the player to select from. Instead, the player is expected to have the speech commands memorized and to have the ability to seamlessly command his character without the help menus present in the other mode. In a gaming system, a user controls actions of characters in the game environment using speech commands. In a learning mode, available speech commands are displayed in a command menu on a display device. In a non-learning mode, the available speech commands are not displayed. 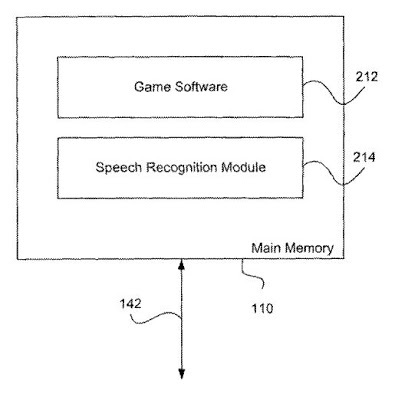 A speaker-independent context-sensitive speech recognition module contains a vocabulary of available speech commands. Use of speech commands is combined with input from a controller device to control actions of a character or characters in the game environment. 1. A method for training a user to utter a sequence of commands in a game environment by using voice control, the method comprising: executing first instructions stored in memory to determine a context based on a state of the game environment, the first instructions executed using a processor; displaying a menu of available commands based on the context; prompting the user to issue a vocal utterance associated with an available command from the menu of available commands; receiving a vocal utterance from the user; executing second instructions stored in memory to match the received vocal utterance with an available command from the menu of available commands, whereby the matching of the vocal utterance with an available command selects the command, the second instructions executed using a processor; adding the selected command to a sequence of commands including commands selected since a previously executed complete command; and executing the sequence of commands when the sequence of commands forms a complete command.